For the Flytec 6015 it was achieved for the first time ever to integrate a 20-channel GPS high-performance receiver into a small flight instrument. The FLYTEC 6015 GPS hereby sets absolutely new standards. It is perfectly well tailored to the requirements of para glider and hang-glider pilots and is distinguished by an astonishingly easy user prompting. Update rate of 1 second, independent from present recording rate. 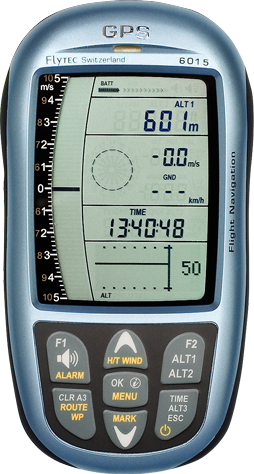 Records maximum 50 flights with date, start time, flight time, max altitude and min/max Vario, recording time up to 120 hours at 30 seconds recording rate with position, barometric altitude and GPS-altitude, satellite constellation and True Airspeed. Recording interval: Adjustable from 1 up to 30 seconds. Flychart provides for additional individual settings, e.g. audio pitch, response characteristic, sensitivity etc., flight statistics, flight database, print-out. Firmware update with the Flytec-Flasher tool. IMPORTANT: when updating from Firmware version 1.1xx to 1.3.07, it is mandatory to delete the flight memory after the update: Menu -> flights -> delete. Otherwise there might arise problems upon download of flights with Flychart or any other flight analysis software. NOTE 1: For the instrument settings Flychart version 4.52.46 is required. After a new installation or a reinstallation of Flychart on newer Windows operating systems (Vista, Windows7) it may happen that the flasher does not work correctly anymore. We recommend to uninstall the USB drivers “PL-2303 USB serial” with the control panel and to reinstal the Prolific USB driver from our Web site. This should fix the problem.